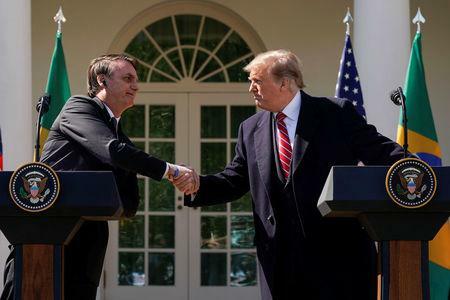 WASHINGTON (Reuters) - U.S. President Donald Trump and Brazil's new far-right leader Jair Bolsonaro forged a bond over their shared brand of conservative and populist politics on Tuesday, with Trump pledging to give more U.S. support to Brazil's global ambitions. In a joint news conference in the White House Rose Garden, Trump said he told Bolsonaro he would designate Brazil a major non-NATO ally and possibly go further by supporting a campaign to make Brazil "maybe a NATO ally." Bolsonaro, a former army captain who rode to the presidency with a brash, anti-establishment campaign modeled on Trump's 2016 run, has declared himself an unabashed admirer of the U.S. president and the American way of life. "Brazil and the United States are tied by the guarantee of liberty, respect for the traditional family, the fear of God our creator, against gender identity, political correctness and fake news," Bolsonaro said, touching on themes that have inflamed his critics in Brazil concerned about his autocratic views. Nicknamed the 'Trump of the Tropics,' Bolsonaro rose to power praising the U.S.-backed military government that ran Brazil for two decades before a return to democracy in 1985. At Tuesday's news conference, the two presidents repeatedly rejected socialism, celebrating their joint efforts to oust Venezuela's left-wing leader, Nicolas Maduro. They showed an easy rapport, exchanging soccer jerseys from their national teams at the outset of their meeting in the Oval Office, with Trump's name emblazoned on Brazil's famous yellow shirt and Bolsonaro's on the USA uniform. The two also share a penchant for family politics, employing relations as some of their closest advisers. In the Rose Garden, Trump praised Bolsonaro's son Eduardo, a congressman who sported a Trump 2020 hat when visiting Washington last year. Bolsonaro's Economy Minister, Paulo Guedes, on Monday urged the United States to open its market more to Brazil if it wanted to change the status quo. Trump also said he supported Brazil's efforts to join the Organisation for Economic Co-operation and Development (OECD), a club of wealthier nations sharing best practices on economic policy. Becoming a "major non-NATO ally" implies a status upgrade that gives a country preferential access to the purchase of U.S. military equipment and technology. Supporting Brazil for an association with NATO would be a considerable step further, one that Trump recognized would mean he would "have to talk to a lot of people." In a Fox News interview on Monday, Bolsonaro threw his weight behind Trump's immigration agenda, which includes a wall on the Mexican border. "I meant to say that a little part of the people who immigrate don't have good intentions and I made a mistake. I apologize for that," he said.